^ Oasis of the Seas: Summary. Det Norske Veritas. 2009 [1 November 2009]. ^ 3.0 3.1 3.2 3.3 Oasis of the Seas: Dimensions. Det Norske Veritas. 2009 [1 November 2009]. ^ 4.0 4.1 4.2 Creating the Incredible (PDF). STX Europe via CruiseWeb.nl. November 2008 [24 October 2009]. （原始内容 (PDF)存档于2009年10月24日）. ^ 5.0 5.1 5.2 Oasis of the Seas: Fast Facts (PDF). 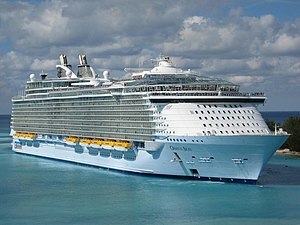 OasisoftheSeas.com. 10 September 2009 [24 October 2009]. （原始内容 (PDF)存档于2012年2月20日）. ^ Oasis of the Seas: Machinery Summary. Det Norske Veritas. 2009 [1 November 2009]. ^ Royal Caribbean selects Oasis of the Seas and Allure of the Seas as the names for its Project Genesis ships. Royal Caribbean International. 2008-05-23. ^ Royal Caribbean's next ships will be Oasis, Allure. USA Today. 2008-05-23 [2008-05-23]. ^ Aker Yards press release, Royal Caribbean orders another giant cruise vessel from Aker Yards, 2007-04-02.